There is no end to the amount of culinary information available on the Internet. However, if you don’t keep your laptop in the kitchen, chances are it does little good. Sure you could print out content (gasp!) and follow along, but that doesn’t help much when it comes to video tutorials. Belling has teamed up with chef Brian Turner and will be releasing the Media Chef. Preloaded with 48 recipes for the home cook to follow along with, the 8-inch kitchen gadget provides a video reference suited for the kitchen. Complete with a remote control, the demonstrations can be paused and replayed, allowing users to follow along at their own pace. 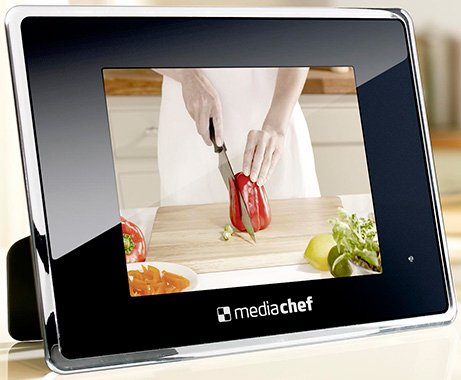 Details are sparse regarding additional content, and how kitchen-proof its construction really is, but it is known that when it is not in use it also features a calendar, an mp3 player and at the end of the day turns into a digital photo frame that could showcase all of your delicious results.